Don't you just love when you find a recipe that is healthy but tastes like it isn't? That's how I would describe this dish. It's rich, full-flavored, and healthy. Yes, I said healthy! I had chicken breasts, and corn tortillas and wasn't feeling inspired but knew whatever I was going to make needed to be healthy. I ended up finding a recipe for something similar and then in true Kristen form revamped the whole thing. The original inspired me but was just too packed with calories for my "goal" of eating better. I removed a lot of the cheese, (I know, I know... it's so good, but I promise you won't miss it,) and used reduced fat sour cream. Another bonus for this recipe? It's fast and easy! Total prep time was about twenty minutes and that could be reduced if you choose to use rotisserie chicken instead of cooking it at home. Although it's healthy AND fast.. it is NOT lacking in flavor. Heat a large skillet over medium heat, and spray with vegetable cooking spray. Saute chicken until cooked through. Add in beans, chilie, jalapenos, and bell pepper. Saute for about 3 more minutes and add salt, pepper, and garlic powder. Spread half of the jar of salsa over the bottom of an 8x8 baking dish. Place 5 tortillas over the sauce, overlapping if necessary. 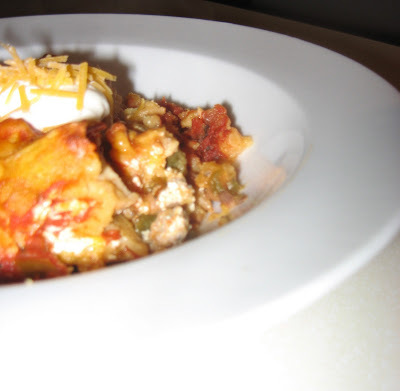 Spoon half of the chicken mixture over the tortillas, and sprinkle with half of the cheese and half of the sour cream. Layer the remaining chicken mixture over the tortillas. Cover dish with a lid or aluminum foil. Bake for 30 minutes in the preheated oven. Remove the cover, and sprinkle the remaining cheese over the top and dot with sour cream. Continue cooking, uncovered, for an additional 10 to 15 minutes, or until cheese melts. Let stand 10 minutes before serving. There you have it. That was pretty easy, wasn't it? I thought so too. And it tastes JUST like an enchilada! Since you saved all those calories you could even enjoy a margarita and not feel guilty about it!